In the lobby of the Samsung Hospital Funeral Center in Seoul, clusters of mourners dressed in black confer solemnly ― a common sight in mortuaries everywhere. But Samsung is one of South Korea’s technology leaders, so it is not surprising to also see an electronic screen with high-resolution pictures of the deceased and information on which of the 20 halls their services are being held in. Whereas several cultural causes have been revitalized in recent years ― hanok, makgeolli, even Confucian weddings ― others that are not catching public enthusiasm seem to be quietly disappearing, including the elaborate and lengthy collection of ceremonies that comprise the traditional Korean funeral. 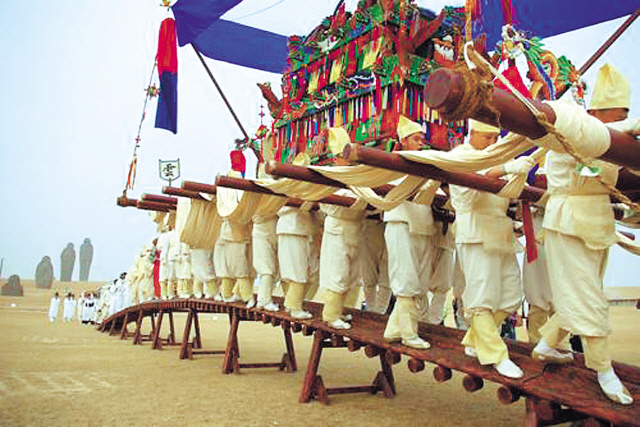 The most visible of these ceremonies is the funeral procession, in which a brightly painted, intricately carved bier is carried to the gravesite. In the more remote areas of South Korea, it is still possible to witness such a procession of pallbearers. Dressed in coarse hempen garments and raised hats, these mourners move down the road while repeating the lines of the funeral singer and stepping to the rhythm of the drums. These days, though, the large hospital mortuaries in Seoul are leading the way in the development of modern funerals. Cremation is now more common than burial, in part because land is becoming scarcer, but also, according to some, because the upkeep of a burial mound takes a fair amount of effort. 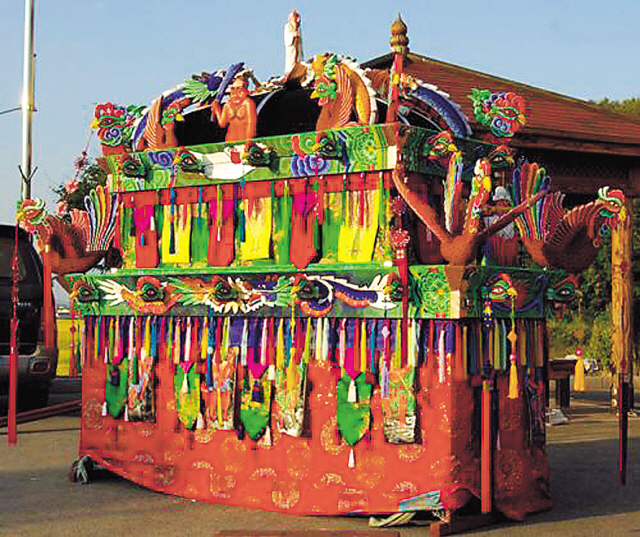 In Seoul’s eastern district Gangdong, however, a local preservation association has been established to perform a festival version of the funeral procession and a distinct type of regional funeral song called “bawijeol hosangnori.” Two singers of this district, Lee Jong-cheon and Lee Jae-kyeong, were together in 1996 appointed intangible heritage asset No. 10 by the Seoul city government. Currently they supervise several instructors and students. Another intangible asset, living north of Seoul in Yangju, is Hwang Jeong-seop, head of the local association for the preservation of funeral song. In a recent interview, he predicted that the rate of cremations will rise to 90 percent in South Korea and that traditional burial culture will completely disappear. Traditional pastimes such as field songs and kite flying are still popular because they are easy to learn, he said. On the other hand, “To carry the coffin is difficult so they don’t want to do that.” The association had performed four authentic funerals this year, all of them on a voluntary, unpaid basis. Despite these two preservation associations and an annual funeral song festival in Hoeseong, Gangwon Province, the replacement of traditional ceremonies with hospital mortuary services may be complete within a generation. An increasing range of services are now provided by the Seoul Municipal Cemetery and at the major hospital mortuaries. All the needs of the bereaved families can be provided on the spot ― from funeral photo service, to mourning garb rental, to clothes for the deceased and paper to wrap the body. Funeral center web sites allow sympathizers to post condolence messages for the family and to access information on funerals in progress. Korean funerals generally last for three days. In response to private companies that now offer all-inclusive personalized funeral assistance in return for monthly payments, similar to insurance schemes, places like the Samsung Hospital Funeral Center have begun offering coordinator services for grieving families. Caught in the transition between the traditional and the modern, many appreciate having a coordinator to guide them through the process and inform them about the proper etiquette. Funeral singing, for instance, is virtually impossible. The staff member pointed out that because the funeral halls are adjacent to one another, mourners are prevented from making too much noise. Traditional wailing is prohibited, of course. On Nohwa Island, off the southern tip of mainland South Korea, funeral biers are still used, but only because there are no hospitals on the island, according to Jeon Do-yong, a retired district chief and funeral drummer, who last performed two years ago. His prediction is that the practice of cremations will eclipse traditional burial culture in only ten years. According to Jeon, people use hospital funeral homes because they cost less compared to the traditional wake and funeral. The two remaining funeral singers on Nohwa Island are both in their 80s, though they stopped performing at about the age of 60. The reason why they stopped, Mr. Jeon says, is that they would rather not sing at a funeral for someone younger: if someone younger than them dies, it is not considered a “good death” and is not something to celebrate. A few years ago, Jeon went to the next village to help with a funeral. When he gathered the pallbearers and tried to practice the song for the procession, it turned out that none of them knew it.